Please refer to our stock # 40H67-143 when inquiring. Eric Tobin - Farm on the River, Worcester, VT. Oil on canvas. Size: 20 inches x 24 inches. Dated 2016. Signed in lower right and titled, dated and signed on the stretcher. Framed by the artist in a silver leaf wood frame. A yellow and red farm complex in winter, nestled in a river valley in Worcester, Vermont. Eric Tobin is a contemporary Vermont landscape artist. 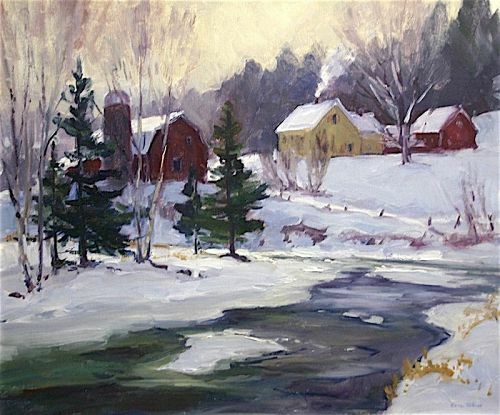 He resides in the northern part of the state in Johnson, VT. Tobin was greatly influenced by the Vermont painter, Thomas Curtin, whom Tobin knew from his childhood and from whom he received his first set of paints. Tobin paints entirely 'en plain air,' or outdoors while actually viewing his scene. Tobin is largely self-taught, but did receive one-on-one instruction from Fred M. Hines, a marine artist in Maine who later moved to Johnson, VT.